In her groundbreaking book The Southwest Airlines Way, Jody Hoffer Gittell revealed the management secrets of the company Fortune magazine called âthe most successful airline in history.â Now, the bestselling business author explains how to apply those same principles in one of our nationâs largest, most important, and increasingly complex industries. 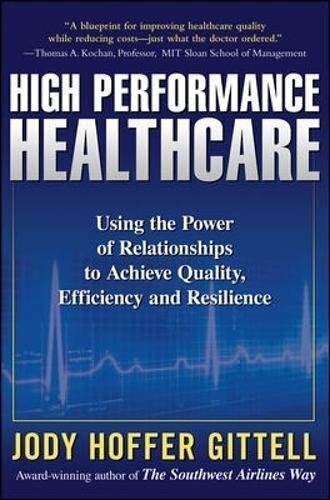 High Performance Healthcare explains the critical concept of ârelational coordinationââcoordinating work through shared goals, shared knowledge, and mutual respect. Because of the way healthcare is organized, weak links exist throughout the chain of communication. Gittell clearly demonstrates that relational coordination strengthens those weak links, enabling providers to deliver high quality, efficient care to their patients. Using Gittellâs innovative management methods, you will improve quality, maximize efficiency, and compete more effectively. The book includes case studies illustrating how some healthcare organizations are already transforming themselves using Gittellâs proven tools. It concludes by identifying industry-level obstacles to high performance healthcare and showing how individual organizations and their leaders can support sweeping change at the highest levels. Policy changes and increased access to care will not alone answer the healthcare industryâs problems. Timely, accurate, problem-solving communication that crosses all organizational boundaries is a powerful response to business as usual. High Performance Healthcare explains exactly how to achieve this crucial dynamic, providing a long-awaited cure to an industry in crisis. About: In her groundbreaking book The Southwest Airlines Way, Jody Hoffer Gittell revealed the management secrets of the company Fortune magazine called “the most successful airline in history.